This week, Kirk and I managed to install the rest of the irrigation system for the second living wall, which proved successful. 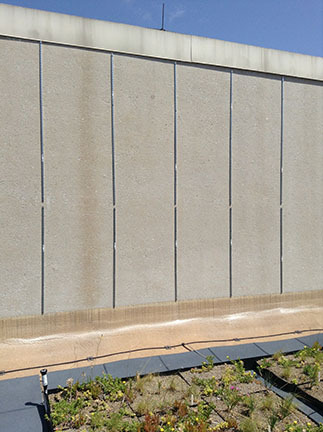 The only issue we noticed was that the water pressure for this wall was much stronger than that of the first wall, which we assumed to be a result of its close proximity to its water source and fewer drip lines running through it. Following the completion of the irrigation system, we proceeded to wrapping up some of our plant specimens and inserting them into the pockets of the second living wall using a similar design style as the one used by Patrick Blanc. So far, we’ve only managed to plant about 10-15 specimens, but we are definitely pleased with how the project is turning out. Our next step is to continue wrapping up the remaining plant specimens and insert them into their respective pockets/panels using the design concept that was discussed prior to planting. While this phase of the project has only just begun, we are very excited to see the end result of our hard work and effort. 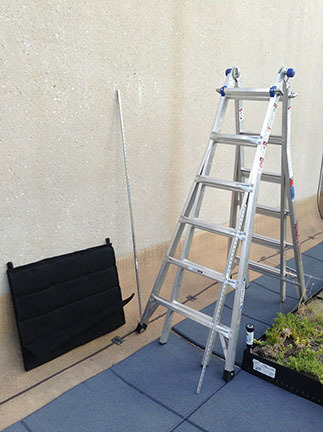 For our last meeting during Summer I, Kirk and I began to work on the irrigation system for the second living wall. This was my first time working on irrigation, so I was glad that Kirk was patient enough to guide me through the process. We managed to get most the irrigation work done, with the exception of the water line that connects with the drip irrigation system of the living wall. But, on the plus side, I got to learn how irrigation systems work, especially when dealing with a drip system, which requires just the right amount of water pressure. This week, we finally managed to get all of the Flora Felt panels hung up on the metal strips that we had installed the previous week. No planting has been done yet and is unlikely to get underway until July. 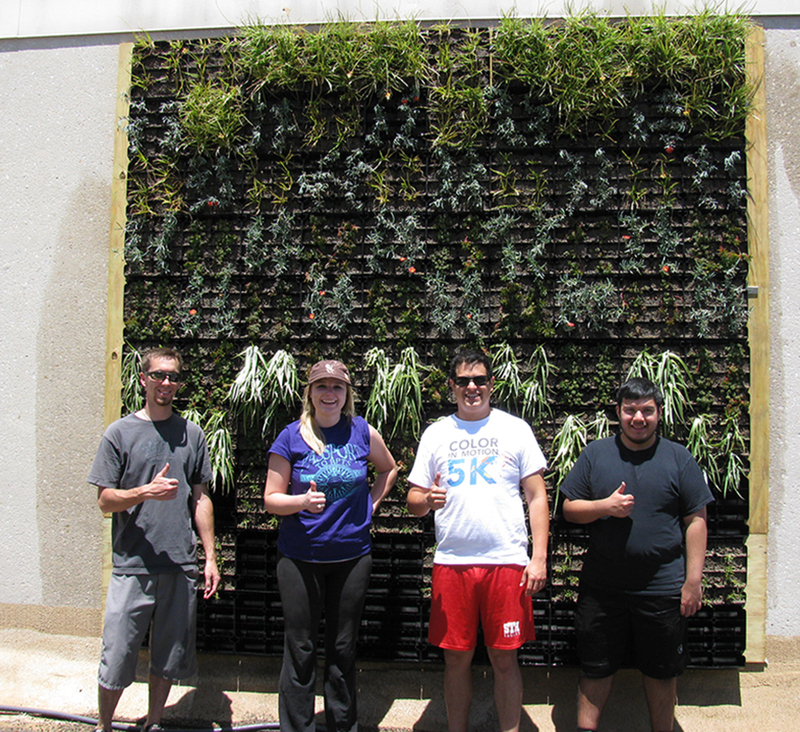 Unlike the first living wall system we built, this one proved to be much easier and lighter to assemble. However, this does not necessarily imply that it is a better system or that it will prove effective in the long term. One of my concerns with this system so far is that it appears to lack sturdiness. This may change once the plants are put in, but this wall seems like it could easily be blown away with a powerful gust. 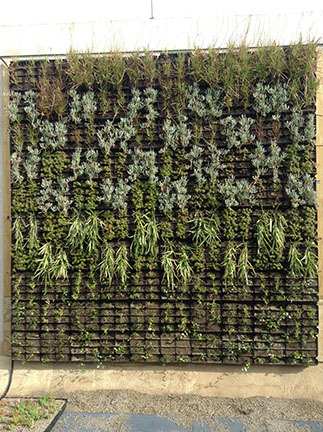 Fortunately, one of the purposes of this project is to determine what works and doesn’t work in regards to living wall systems. Despite the uncertainties, I can only hope that this system does prove successful in the end. The second week of June was mostly spent discussing possible living wall systems and plants to test out for our new project. 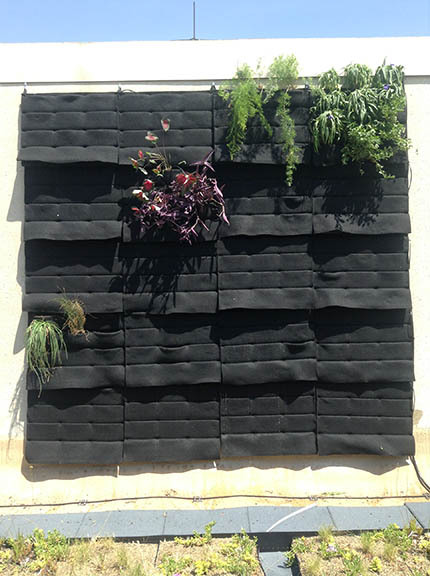 In the end, Professor Dvorak, Kirk and I agreed to go with a living wall system called Flora Felt, which is a vertical garden planter system consisting of fabric and recycled plastic. 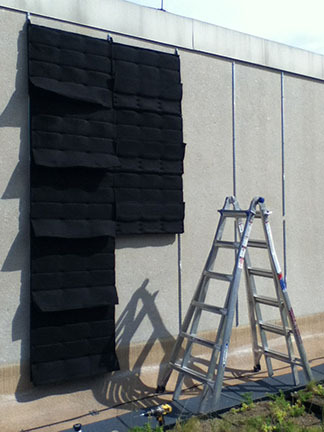 Unlike with the previous living wall, these panels are made of pockets for which to put the plants in. However, there are a few other mechanisms that are different this time around. 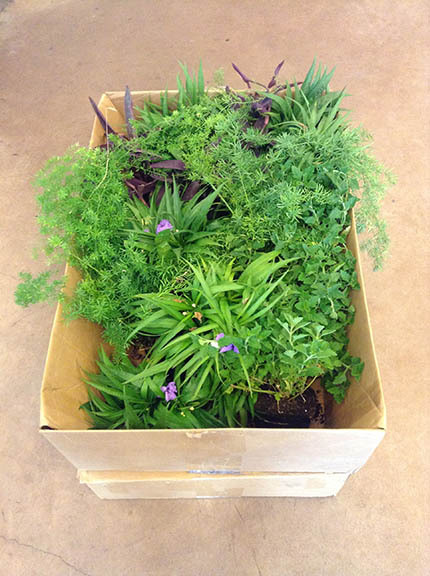 While the first living wall system was designed to retain soil for the plant specimens, this system is based on both hydroponics and soil retention. 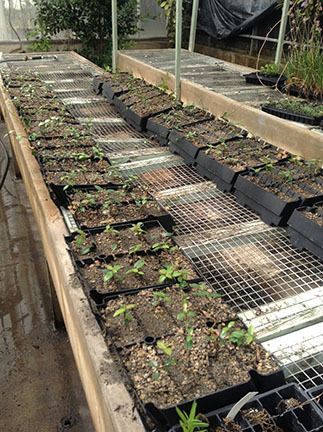 We also opted to utilize wholesale and store-bought plants instead of propagating and growing our own; thus making the process of planting a little easier and quicker than last time. 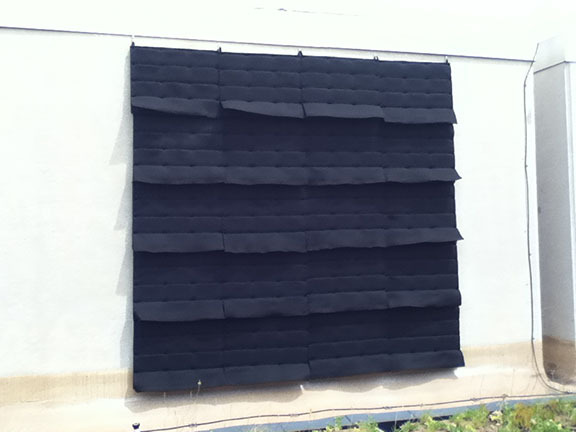 Furthermore, instead of just inserting the plant specimens into the pockets, each specimen will be wrapped in a fabric cloth provided by Flora Felt, making it easier to assemble and disassemble the living wall system as needed, as well as, proving useful in replacing dead or damaged plants. For the first week of summer classes, Kirk and I proceeded to plant the remaining modules for the living wall we built this past spring. The only specimen we failed to plant last time was Asian Jasmine, which was undeveloped at the time that the wall went up. Once the Asian Jasmine specimens got settled in the modules, we went ahead and installed them with the other modules, hence completing the first living wall. Now, the only thing left to do for this wall is to install a wooden frame around it, for which we already have the wood to begin assembling it.